One lazy Friday summer, my travel buddies and I decided to take a break from work and explore this magnificent province of the North – Pangasinan. From the beautiful coastline of Bolinao to the world famous tourist spots in Alaminos, this province is definitely a must for those who love to travel! Summertime is here, and we don’t know yet where our next destination will be, so my travel buddies and I shared ideas on where to go next. We saw Pangasinan on the map and decided to go to Hundred Islands. We took a Friday leave and left the office immediately after our Thursday shift. There were no vehicles on the road, so we managed to get into the bus station in Cubao within 20 minutes. We initially chose to ride Five Star bus; unfortunately, there were no air-conditioned buses bound for Bolinao that time, so we decided to walk for a couple of minutes until we reached the station of Victory Liner Bus. The bus left Cubao at 7 o’clock, and there is no traffic around the metro that time. 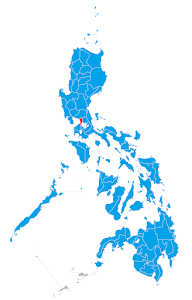 We passed through the provinces of Bulacan, Pampanga, and Tarlac before reaching Pangasinan. The bus fare was P459, and it took us 6 hours to reach the town of Bolinao. This is the second time I set foot in Pangasinan, and I can still remember the first time we met: it was back on April 21, 2012, when my family decided to have a quick lunch at a seafood restaurant in Urdaneta City after a quick weekend getaway in San Juan, La Union. After reaching the town proper, we immediately asked a random tricycle driver if he could tour us around the town, and we agreed to pay him P800. Before we start off our journey, we first had our lunch at Kambingan sa Adoras, located just outside the Poblacion barangay hall. I ordered chicken afritada for myself and paid at least P50 for my meal. After eating our lunch, we headed straight to our hotel – Rock Garden Resort. We already had our reservation days before we arrived and the cost for our three days/2 nights stay was P3000 (we split up the bill at 750 per person). After putting up our things inside our cozy native styled room, we started the tour around the town. It was already 2:00 PM, and we don’t know if we can go through all the tourist spots listed on the map that we downloaded. The first stop that we had was at the Bolinao Lighthouse. It was a white lighthouse standing mightily above the cape of Bolinao – guiding ships ages ago to their safety. There was also an abandoned building next to the lighthouse, and it feels kind of creepy every time I peeked inside its tattered windows. Then there was the viewing deck just beside the lighthouse. It offers you a magnificent view of the West Philippine Sea, and you can see cargo ships passing by. After taking a couple of photos, we decided to get to our next destination – Patar beach. Unfortunately for us, it was already 4 PM, and we won’t be able to visit other tourist spots (Enchanted Cave, Cindy’s Cave, and Wonderful Cave). We managed to reach the beach after 10 minutes, and I was surprised seeing a beach this good. The sand was fine, and it has this distinct golden color. The sea, on the other hand, was clear, and it was turquoise in color, which greatly compliments the sand. There were also few people around, which make this place perfect for relaxation. We also witnessed the setting of the sun, and it could rival that of Manila Bay’s. We didn’t stay for too long in Patar beach because it’s getting dark, so after an hour, we already decided to leave. We hopped onto the tricycle and braved another 21 kilometers of dirt road back to our hotel. The second day is here! And based on our itinerary, we would be spending our whole day traversing the Hundred Islands. We packed our things early and went to the town proper where we could get a van that will take us to Alaminos City. While waiting for the van to leave, we never expected that Bolinao is having a town festival today. It is called “Mangunguna Festival,” which means “Fishermen’s Festival.” Performers dance in the streets, complete with fisherman attires, and other costumes that represent marine life. After waiting for a couple of minutes, the van left Bolinao for Alaminos. The fare was P60, and it took us about an hour to reach Alaminos. We decided to eat our breakfast first at Mcdonald’s, and then we rode on a tricycle bound for Lucap Wharf. Before reaching the Hundred Islands, we first registered our personal information at the tourism office located within the wharf and paid for the boat ride, life jacket, snorkeling gear, and some other miscellaneous fees. It was P1400 for a whole day boat ride and another P300 for the gears that we would need. Welcome to Hundred Islands! It's like a dream come true! The sea was calm, and so we started our voyage to reach the islands. It took us 30 minutes to reach the first island on the list – Governor’s Island. 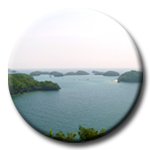 This island is the perfect place to get a panorama of the Hundred Islands. There is a small cave too, and then the Big Brother’s hotel (it’s too expensive though). To reach the view deck, we had to do a short trek, climbing up the steep island staircase. It’s somewhat tiring, but it will all pay off once you reached the top. The next destination on our list was snorkeling in an area full of clams. This is my first time snorkeling, and I loved the scene I’ve seen down below the sea. There were lots of tropical fish that were very playful, and I’ve also seen the clams down below, opening their shells, and closing it back. After spending almost half an hour snorkeling, we visited the next destination on our map – Marcos Island. This island is famous for cliff diving, done inside a cave. I’ve also seen a couple of campers who already set up their tents in the sand. I tried cliff diving, and this is my first time doing it. Since I don’t know how to swim, I jumped off with my life jacket on. It hurts, but the adrenalin rush was extreme, and the feeling’s great! The next island on our list was Quezon Island. Here, you can swim in a vast area of the sea that’s only 2 to 4 feet deep, so drowning is not an option. The place is similar to the Caribbean. White sand, blue sea, summer sun – all wrapped up in this paradise. There are lots of tourists on the island as well, but the sea was so vast that it could accommodate everyone. Lunchtime is up, and we headed to the final island on our list – Children’s Island. Children’s Island is located next to Quezon Island, and there are lots of cottages for family picnics and group lunch. There are also smaller islands nearby, and because the water is just 4 feet deep, you can go island hopping only by swimming (without the fear of drowning ☺). Since the food on the island is too expensive, and I don’t have any money left, I just had an ice scramble as a snack, and enjoyed the view until it’s time for us to go. It was already 4 PM when we decided to leave the Hundred Islands. We braved the seas as the waves build up, and safely made it to the pier. We also passed by a souvenir store, where I bought ref magnets and a souvenir shirt for myself. Then we headed to a small store where we paid to take a bath and change our clothes. We reached the city proper around 5 PM and decided to have our late lunch at Mang Inasal (inside Magic Supermarket). I ordered the world famous Pangasinan Grilled Bangus (Milkfish), and it tasted good! We also bought additional supplies, like bottled water, before heading back to the town of Bolinao. It was already 6:30 PM when we finished our late lunch, and locals told us that the last van en route to Bolinao would leave at 7 PM. Thank God we managed to get there in time, and safely returned to our hotel room around 8:30 PM. We ate our dinner back at the hotel and decided to sleep later on. Time flies so fast, and now, we have to leave – but before leaving Pangasinan, my officemates decided to go back to Patar Beach one last time (since we didn’t enjoy swimming there for only an hour last Friday). We fetched a tricycle at the town proper who agreed to take us there and wait for us for only P500 (it’s a 42 km roundtrip journey, so it’s not that bad). It was 8 AM when we arrived at the beach, and we were surprised because compared to the serenity of the area last Friday, it’s now completely different. Tourists flocked to the beachfront, and there are lots of buses and vehicles parked outside. Nevertheless, we still enjoyed bathing in Patar’s cold, turquoise beach waters. We decided to go back to the hotel before noon so that we can check out early. We asked the driver to return us to our hotel, and then we already packed our things. After checking out, we decided to buy “pasalubong” at the town plaza and the nearby marketplace, and I got myself a bunch of kakanin (puto, tupig, suman). I also bought their famous bagoong and a couple of souvenirs for our friends before heading to the bus station. Queues are already building up in the bus station when we arrived, but we still managed to ride the next bus heading to Manila. Now, we’re going back to the busy streets of Manila – back to our reality. But I must say that I enjoyed this three day trip to Pangasinan. Hopefully, this won’t be my last time meeting you. I will come back; I will surely do. 1. Ride a Five Star Bus from Cubao going to Bolinao. Regular fare is P459, one-way. 1. Ride a Five Star Bus from Cubao to Alaminos. 2. Alternatively, you can ride a Five Star Bus from Cubao going to Bolinao. Regular fare is P459, one-way. 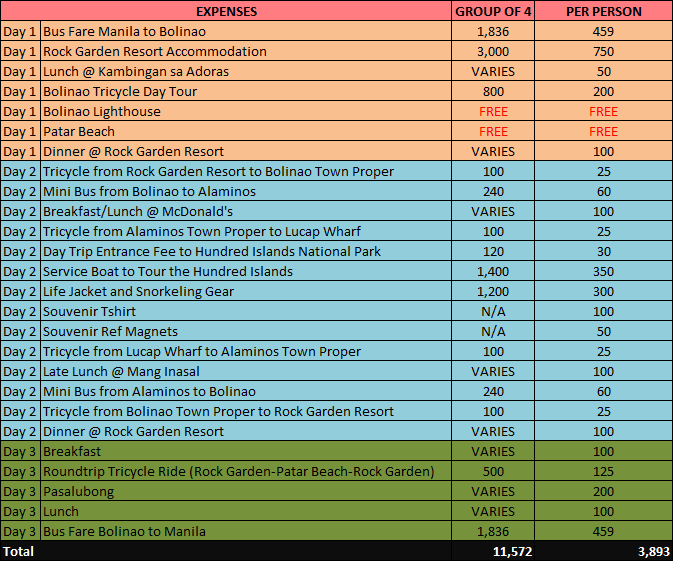 From Bolinao, you can ride a mini bus going to Alaminos for P60. 3. Third option would be riding a bus going from Cubao to Dagupan, and riding a van or a mini bus bound for Alaminos. Hello TJ! My family and myself are planning a trip north and I was surfing the web for stopovers we can do from Manila to Pangasinan. I'm so glad I cam across your site :) I followed your travels and it helped me plot where to go. Thank you for sharing your experience!